Landscape lighting or outdoor lighting is the combination of different lights, colors and light angles which aims to give a dramatic effect on your landscape that no time of the day can ever create. There are many types of outdoor lighting fixtures. Each type is made for a special purpose. Spotlights used in landscapes work similarly to the common spotlights—they give special attention to where they are pointed. This type is perfect for rare and special statues, topiaries, mural, well, or any other special area of the landscape. Flood lights disperse more light and therefore perfect for larger areas. Their angle can also be controlled so that light can illuminate a nearby area. 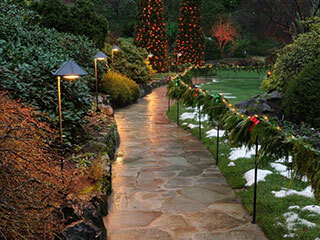 Path lights can be as low as two feet or as high as 10. They are used to guide people as they walk on a walkway, driveway or stepping stones. For stairs, tier lights should be the choice because they direct lights down to the ground. For walls and similar surfaces, the mount or deck lights will be perfect. They are literally installed onto the wall and provide just enough illumination for that mysterious effect. 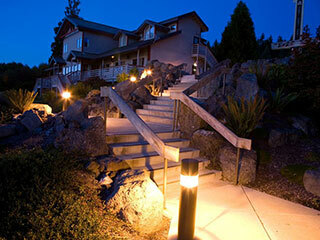 There are still a whole lot of selections on landscape lighting. Getting the set that will gloriously flatter different elements in any landscape is certainly possible. It is perfectly normal to worry about lights used for outdoor lighting installation. Unlike indoors, the world outside is more brutal. Too much heat, extreme wind, heavy rains, natural calamities, stray animals and even the plants can all contribute to the early wearing out of landscape lighting. Concerns about safety are prevalent especially because most homeowners in the country use the conventional electricity to power up outdoor lighting. All these issues should not anymore be issues. Our company only source out the materials we use for outdoor lighting installation from the best manufacturers in the world. Their products have never failed our expectations as well as our clients' satisfaction. This is because their lights were designed and manufactured with durability and safety in mind. These lights are made up of superior materials to withstand any challenge of the outside world. Solar-powered lights are also available if requested. Should you choose conventional lights, don't worry still, because our licensed electricians know how to keep these lights working perfectly safe. Due to economic reasons, we strongly encourage the use of light emitting diodes or LED lights. These lights can provide the same quality of light but at a much lower wattage. While conventional lights can take up 284 watts, LED lights only need 40.5 watts to give the same effect. And lower wattage means lower consumption of electricity. Whatever kind of outdoor lighting display you want to have, Seasons Unlimited Inc. can help you make that a reality. Our company employs professionals who are licensed, skilled and experienced on doing outdoor lighting installation. But we don't just put landscape lighting here and there. We use creativity, making this mere installation of outdoor lighting a display of art.